Every Dog Has Its Day: The Most Optimistic Prisoner? Before talking about his enjoyment of seeing the ocean (or at least the Chesapeake Bay) on his ride from City Point to Point Lookout, Peterson focused his editorial on politics. He commented how he didn’t believe that there would be another Republican in the White House during his generation. “I think our next President will be our ex-President Grover Cleveland,” he declared. “He stood up so manfully for the rights of the people that he well deserves every free man’s vote.” Peterson encouraged his fellow Tar Heels to not “go out of our own State for good timber for President,” preferring North Carolina’s own Zebulon Vance. “I believe there is a brilliant career in store for me in the near future,” Peterson added. “Who knows but I may get to be treasurer or postmaster yet.” He declared he had “a sufficient claim on my countrymen by reason of my war career.” The North Carolinian’s editorial reads to me a lot like Abe Lincoln’s 1848 speech to the House of Representatives in which the Illinois congressman denigrates his own service in the Black Hawk War. Peterson’s comments about his time in Point Lookout most likely serve as a metaphor to how the Democrats should just weather the storm of the Benjamin Harrison presidency and reestablish control of the White House in the 1892 election. If you choose to read more literally, as I first did when browsing old N.C. newspapers, it’s quite the rose-colored sketch that takes you by surprise. Source – “Peterson is With Us.” Newton Enterprise, Newton, NC, November 28, 1890. This entry was posted in Battlefields & Historic Places, Common Soldier, Newspapers and tagged 28th North Carolina Infantry, Breakthrough at Petersburg, Point Lookout. Bookmark the permalink. 8 Responses to Every Dog Has Its Day: The Most Optimistic Prisoner? Interesting ! Thanks for posting ! Glad you enjoyed reading it, thanks for commenting! Very interesting. 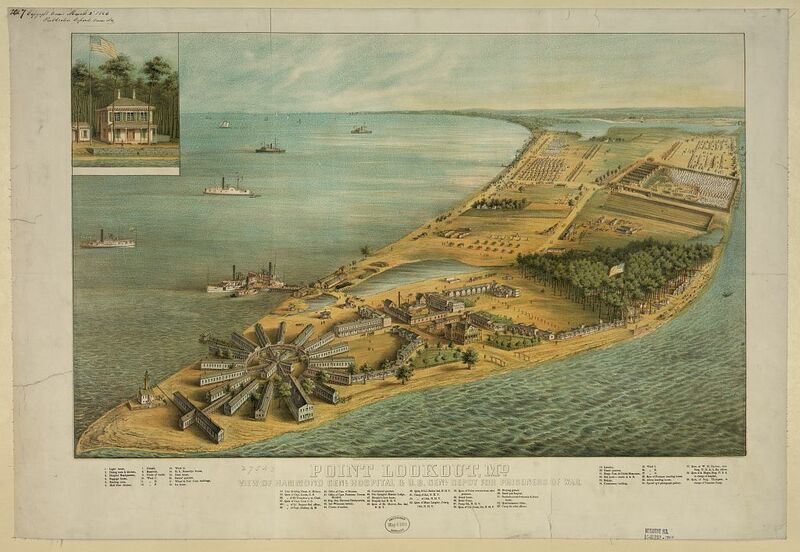 I had an ancestor imprisoned at Point Lookout. Where was he captured? And it should be said–from every other account I’ve read from Confederates held at Point Lookout, their experience was anything but a beach vacation. Ed – Winchester, September 18(?) 1864. Arrived at PL 9/26/94. Paroled in March of 65 and exchanged at Aiken’s Landing 3/15/65, then transferred to Richmond General Hospital. Pvt. Maurice (or Morris) Coffey, Company E, 51st Va. He’s buried on ancestral land about 4 miles (as the crow flies) from my home. Other records indicate he was wounded twice during the war. Welcome to the Chesapeake Beach Club! How much for a bucket of beers? Not a beach vacation by any imagination…more akin to Andersonville. 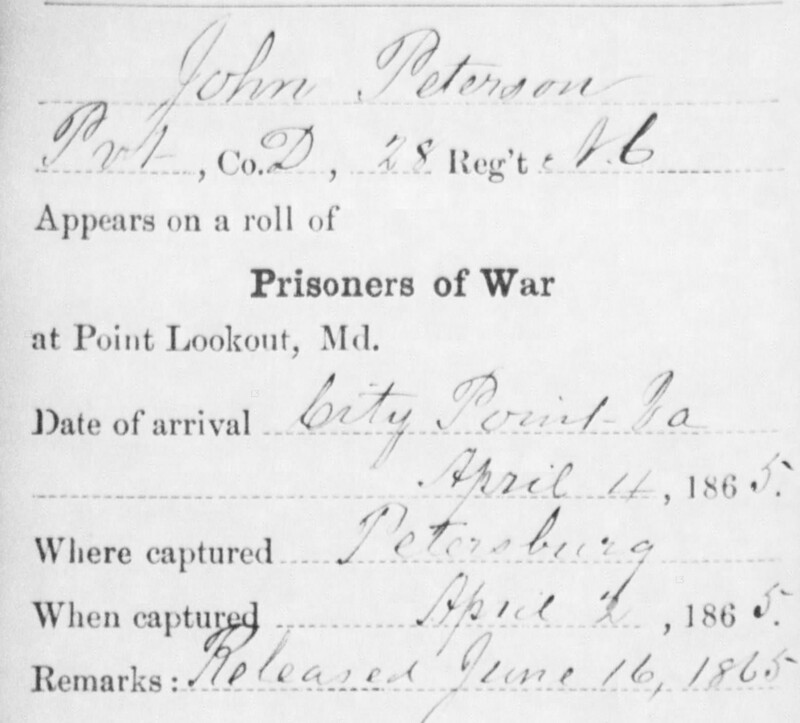 My Gr Gr Grandfather (NC 57th Inf) died at Point Lookout in March 1865 after being captured at Gettysburg. I had two other relatives die there on the Maryland shore at the Camp as well. If the chronic diahrrea did not kill you, the overzealous guards would look for the slightest provocation to shoot you. There simply wasn’t any comparison between the two.